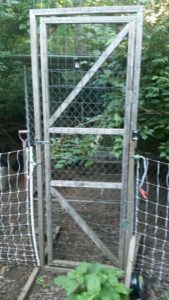 We use the portable electro-net fencing to keep our chickens in (more or less). I think more importantly it keeps the ground based predators out. However I don’t want to always have to cut the power to get in and out. My dad built what is in effect, a portable door out of 2″ x 2″ boards. 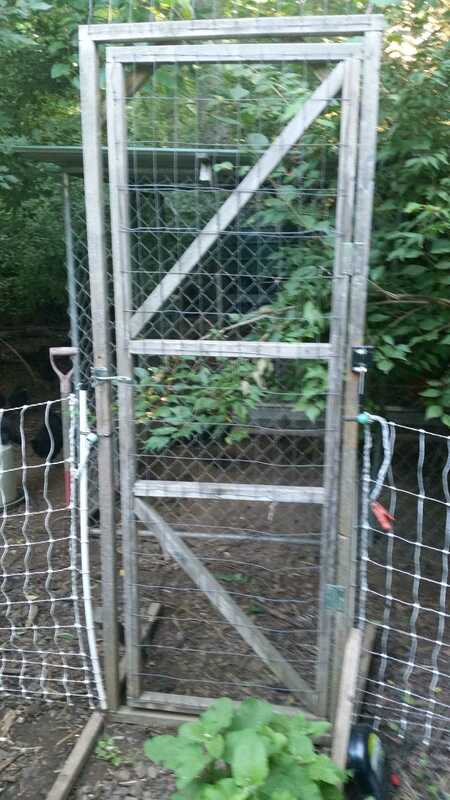 Originally we also ran a wire from the electric fence over to the metal fencing that filled in the door. However that has fallen by the wayside as it didn’t appear necessary after a couple of years. We do have coyotes in the area and this has worked for me for about 5 years now. I don’t believe I’ve ever lost a bird to a ground based predators. Ariel predators on the other hand have been a source of continuing aggravation to me.